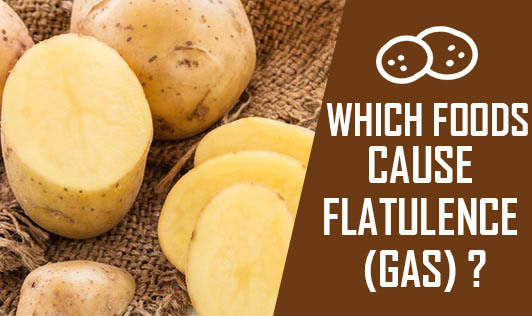 Which Foods Cause Flatulence (Gas) ? Foods that produce gas in one person may not cause gas in another. Most foods that contain carbohydrates can cause gas. By contrast, fats and proteins cause little gas. • Raffinose: Pulses contain large amounts of the complex sugar known as raffinose. Smaller amounts are found in cabbage, Brussels sprouts, broccoli, asparagus and whole grains. • Starches: Most starches (potatoes, corn, noodles, and wheat) produce gas as they are broken down in the large intestine. The starch in whole grains produces more gas than the starch in refined grains. • Fructose: The sugar known as fructose occurs naturally in onions, artichokes, pears, and wheat. It is also used as a sweetener in some soft drinks and fruit drinks. • Sorbitol: This sugar is found naturally in fruits including apples, pears, peaches, and prunes. It's also used as an artificial sweetener in sugar-free gum, candy, and other diet products. • Fiber: Many foods contain soluble and insoluble fiber. Soluble fiber found in oat bran, pulses, peas and most fruits, is not broken down until it reaches the large intestine, where digestion causes gas. Insoluble fiber, on the other hand, passes essentially unchanged through the intestines and produces little gas. Wheat bran and most vegetables contain this kind of fiber. • Lactase deficiency: This result in a decreased ability to digest lactose, a natural sugar found in milk and other dairy products. • Carbonated drinks, dark beer and red wine, also yeast-containing foods such as breads and cheese produce gas. • Foods that produce negligible amounts of gas are rice, most vegetables and fruits mainly bananas, citrus, grapes, hard cheese, meat, eggs, peanut butter, non-carbonated beverages and curd. Minimize your intake of, or avoid consuming foods that cause flatulence for any flatulence relief. Lifestyle habits such as meal timings, regular sleep and most importantly regular bowel movements are also important.